Royal Vegas is a Microgaming-powered casino with over 400 games on offer. A generous bonus package for roulette fans, advanced security efforts and flexible banking options make the casino an ultimate gambling destination for pros and beginners alike. Adding a competitive twist to entertainment, Royal Vegas runs regular tournaments with stunning prizes. The casino’s commitment to quality and fair gaming is certified by eCOGRA, a well-reputed auditing firm. Royal Vegas gives players an option to select from over 40 reliable and globally acknowledged payment methods with fast processing times. Withdrawal limits are capped at $5000 per week, while deposit limits depend on a selected payment system. The casino is evaluated by eCOGRA on a regular basis, and the latest findings reveal that an average payout at Royal Vegas is 96.56% for all games and 97.30% for table games. 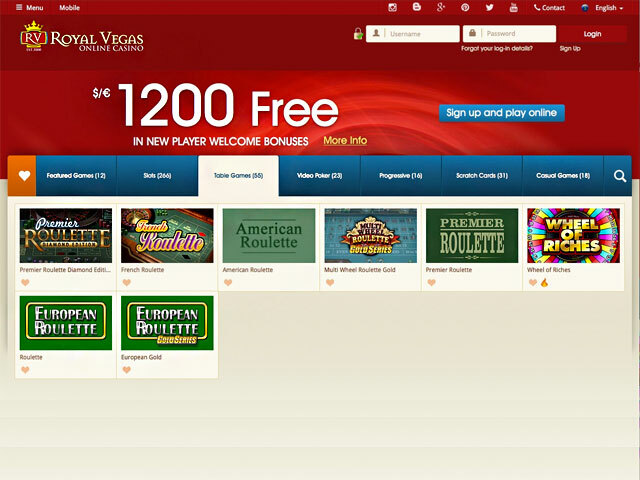 The casino’s site has an adaptive design and scales perfectly well to any user on any device, including tablets and smartphones. Alternatively, a user is offered to download a casino app for a faster and smoother gaming action. Live European Roulette and live Multiplayer Roulette. Newly registered players are entitled to claim the Welcome bonus up to $1200 (x40 WR). For all bonuses, unless specifically stated otherwise for some bonuses, betting on roulette contributes 10% towards WR. The casino runs alluring events and promotions with instant cash prizes and valuable awards such as a trip to Las Vegas.